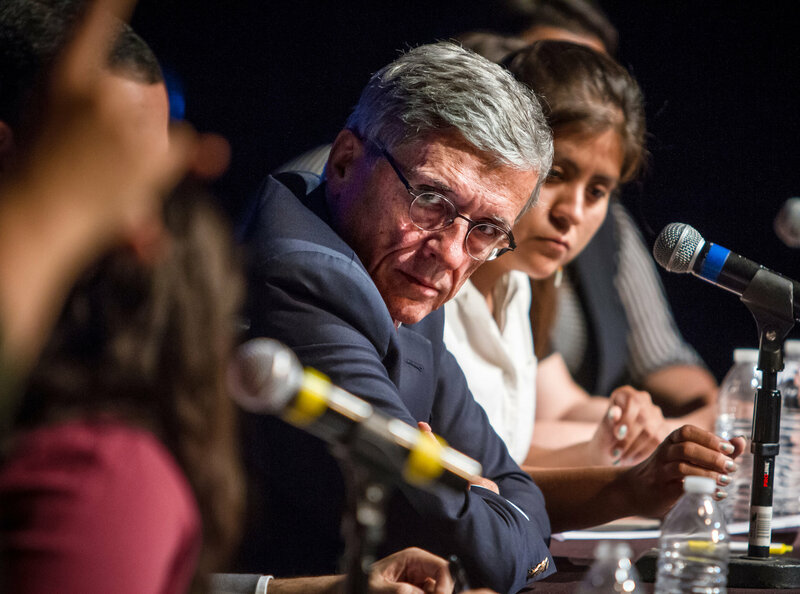 As a lobbyist for the cable and wireless industries, Tom Wheeler played a role in shaping almost every major telecommunications policy and innovation over the last three decades. Cable and telephone deregulation. Internet service in schools and libraries. C-SPAN. None of them, though, have generated as much public interest as net neutrality, the policy most likely to define his time as chairman of the Federal Communications Commission. In the last few months, Mr. Wheelerâ€™s guidelines for net neutrality, the concept that users should have equal access to any legal online content, have become a lightning rod for criticism. More than 3.7 million comments about the policy have flowed to the commission. Many of them argue that Mr. Wheelerâ€™s plan does not go far enough to protect an open Internet. With Perspective From Both Sides of His Desk, F.C.C. Chairman Ponders Net Neutrality – NYTimes.com. The library at Waubonsee Community College offers manyÂ services Â that supportÂ mobile technologies. Â The two newest services this year include our “KwikBoost” charging stations and our “Library Text Alerts” service. 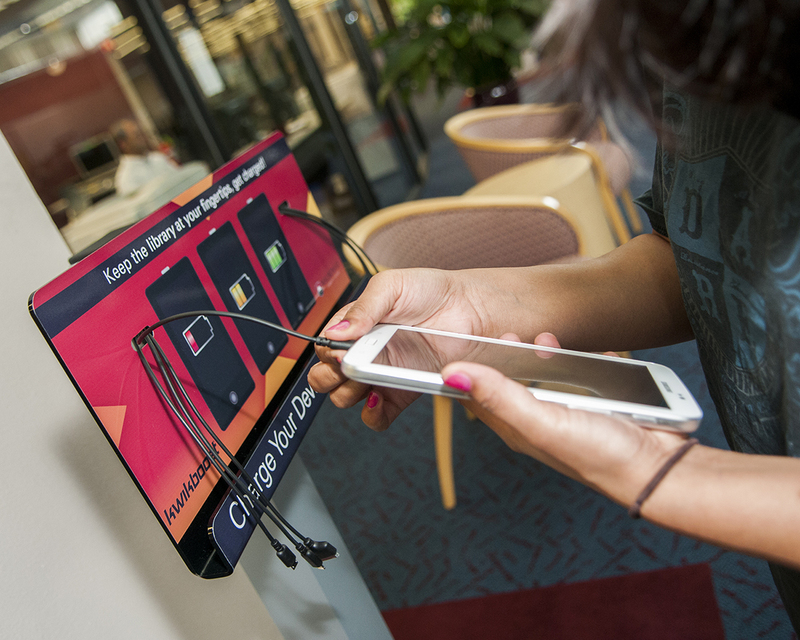 KwikBoost charging stations have been placed in locations within the Sugar Grove and Aurora campus libraries. Â These stations offer reliable, fast charging for mobile devices. Charging your mobile device is a snap with our KwikBoost stations. Don’t worry if you don’t have your charging cable with you, ourÂ KwikBoost stations are already equipped with connectors that fit Â a wide variety of phones and tablets. Â To use a station just plug your device into the appropriate cable, place the device in the caddy on front,Â thenÂ have a seat in one of our comfortable chairs and relax with a book or magazine. Â You mayÂ even want to work on writing that paper you’ve been procrastinating on,Â but if you don’t we won’t judge. Have you ever placed a hold on library materials and then found out they were already waiting for you after you got home? Â Have you ever forgotten about having checked out a book and let it get overdue? Have you ever missed a notification from the library because you forgot about checking your student e-mail address? Â We all have, don’t worry you’re not the first. 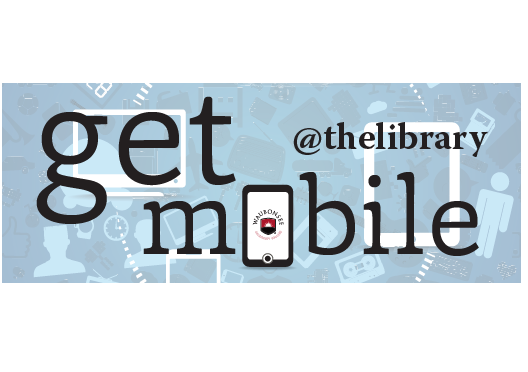 Â The Waubonsee Community College libraries now offer a great new service that lets you opt-in to receive text messages to help you stay current with your library account. 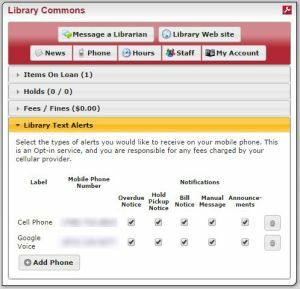 You can specify your cell phone, or other text capable numbers to receive text message notifications for your library account by using our Library Commons portlet in mywcc. To get started receiving text messages sign in to mywcc and select the library tab at the top of the screen. Â Next, clickÂ the “My Account” button in the “Library Commons” window. 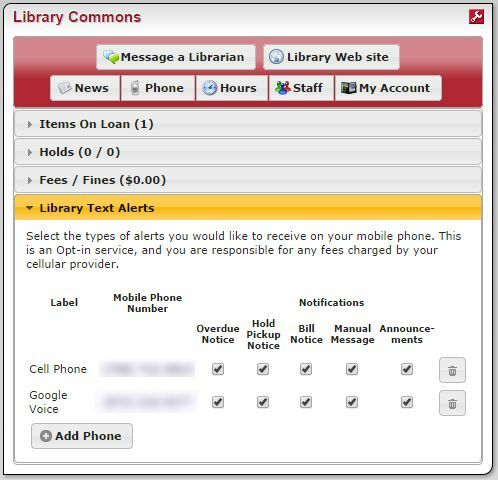 Â From there, choose “Library Text Alerts”. Â You will be presented with options for adding and removing Â phone numbers and for indicating the types of notifications you would like toÂ receive. Â Â Simply make your selections and sign out of mywcc when you are finished. Remember, your phone provider may charge you for text messages and you, not Waubonsee Community College, will be responsible for any charges incurred. Â We will make every effort possible to keep the number of messages sent to a minimum. Â If you ever want to change what notifications you receiveÂ just return to the “Library Commons” and update your preferences. 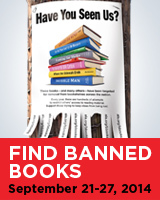 Visit the library during Banned Books Week, Sunday Sept. 21 to Saturday Sept. 27.Â Grab a button, enter the raffle to win a Banned Books Week t-shirt and support your freedom to read! 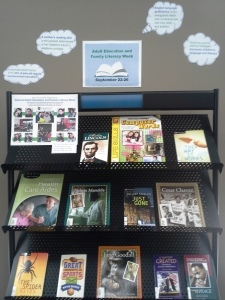 A new display at the Aurora Campus library celebrates National Adult Education and Family Literacy Week, September 22-29, 2014. 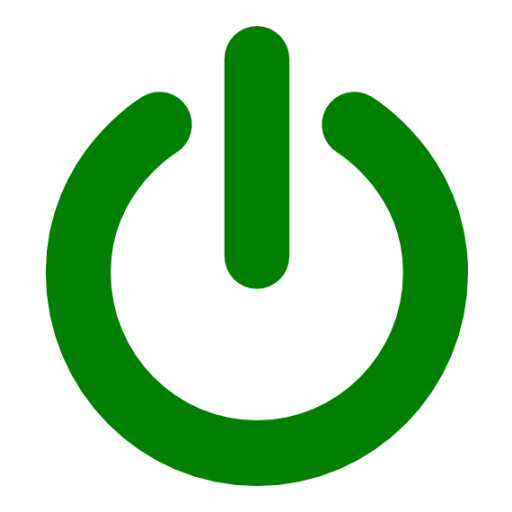 Did you know that the symbol for power / standby mode used on Â most electronics today has existed since 1973? Â At the time, it was included in a standard created by the International Electrotechnical Commission (IEC) for use on various electrically powered equipment. Â Originally this symbolÂ was meant to be used for Â “Standby” mode. 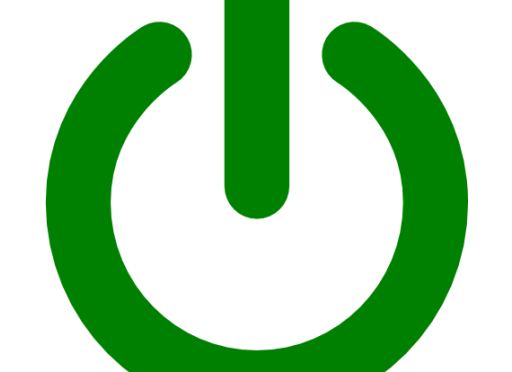 Â It wasn’t until 2004 that its current more generic “Power” meaning was adopted in a standard released by the Institute of Electrical and Electronics Engineers (IEEE). Â The symbol is composed of two superimposed numbers, 1 meaning on, and 0 meaning off.